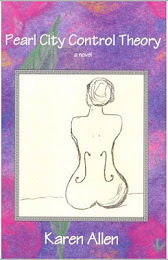 Musings . 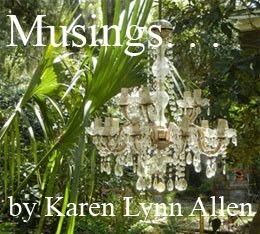 . . by Karen Lynn Allen: Some States Are Adding Wind and Solar Capacity Like Crazy! Is Yours? Some States Are Adding Wind and Solar Capacity Like Crazy! Is Yours? Some very heartening data has come out of the U.S. Energy Information Administration (EIA) in their recently released July 2013 year-to-date numbers on electricity generation by state. Some surprising states are adding wind and solar capacity at an amazing clip: Iowa! Kansas! Oklahoma! Arizona! Nevada! North Carolina! New Jersey! Vermont! Other states are doing little or nothing even when they have excellent wind and sun potential falling in their laps. 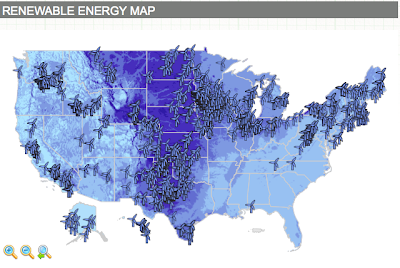 Before we examine each state, let’s consider solar and wind potential on a national level. One U.S. news broadcaster of note reported that Germany has installed 15 times the per capita solar generating capacity of the US because Germany is sunnier than the U.S. Ho, ho, ho! One tiny little internet search will show you that Germany gets less direct energy from the sun than any U.S. state except, possibly, Alaska. Which means every U.S. state except Alaska has decent solar potential. 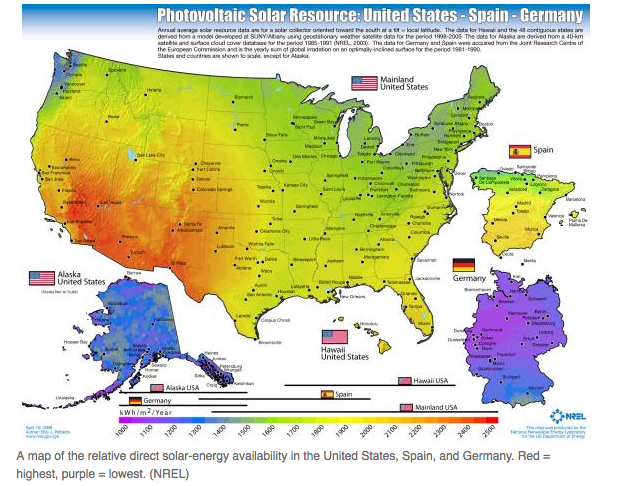 In fact, many US states get far more solar insolation than sunny Spain! Germany is the cold-looking one on the right. As you can see, our southwest states have very, very high solar potential. This means every solar panel in these places would generate double the electricity that the same panel placed in Germany would. Some of these extremely sunny states are taking advantage of this fact. Some are not. Onto wind. Here is a map of wind potential and installed wind capacity cumulative to 2012. As you can see, the whole Midwest from North Dakota down to Texas is smoking hot. Absolutely amazing wind potential. And yet some states are taking advantage of this and some are not. We’ll examine them by census district since that is how the US EIA divides them up. The EIA numbers only include solar energy produced by utilities and Independent Power Producers (IPPs). We have to look separately to find residential solar installations. In the EIA’s national numbers, the electricity produced by residential solar largely shows up not as production but as reduced demand. Note: generally when I refer to renewables, I mean “all renewables except large hydro” and I will spell out large hydro separately. Also note: in general I’m not a huge fan of nuclear power and would rather not see new nuclear plants built. But in my opinion unless one is in a dangerous area or is falling apart, keeping it going constitutes less of a threat than continuing to burn coal. 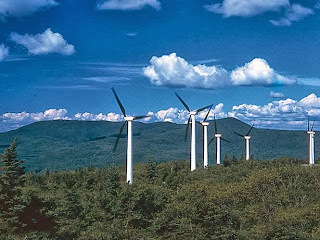 New England: So far in 2013 Maine has increased its installed wind capacity by 12% over 2012, with wind now providing 7% of the electricity it generates. Maine has installed almost no solar. Since Maine exports electricity, if we consider just internal consumption, hydro + renewables covers 72% of Maine’s electricity demand. New Hampshire expanded wind generation last year by 38 %, but the total still comes to a very small amount. If they stopped burning fossil fuels tomorrow, their internal consumption could be supplied by hydro + renewables + nuclear with still 30% left over to sell to other states. Vermont nearly tripled its wind capacity over last year, but the amount is still pretty tiny. However, hydro + all renewables makes up 40% of the electricity it consumes internally. The state has installed a significant amount of residential solar, making it ninth in the nation for solar capacity per person. Vermont has at least as much wind potential as Maine yet has one fourth the installed wind capacity. This data is from 2012. Massachusetts imports 61% of the electricity it consumes, sucking up all the excess electricity from the surrounding states and then some. 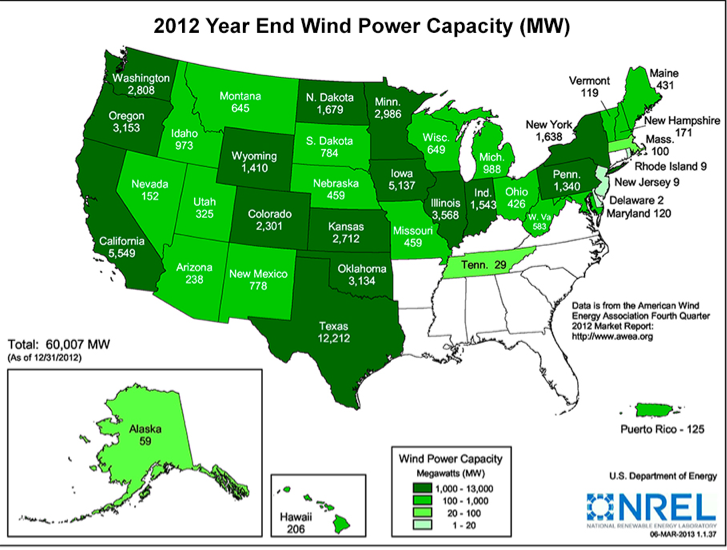 So far in 2013 it has doubled its wind capacity over 2012 and almost quadrupled its solar output from utility/IPPS. Unfortunately, that’s not saying much since both are still tiny. It has, however, installed a significant amount of residential solar, making it 10th in the nation in installed solar per capita. In fact, in the second quarter of 2013, it was fifth in the nation for total solar installations. Connecticut produces about half the electricity it generates from nuclear, almost none from wind or solar, and is a sizable energy exporter. If the state stopped burning fossil fuels tomorrow, it could cover 66% of its own electricity needs with nuclear + hydro + renewables. 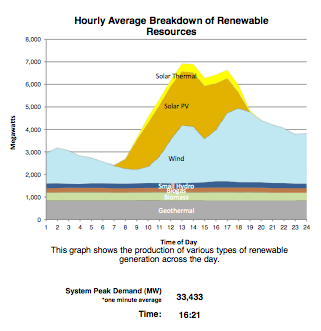 Rhode Island produces almost no electricity from wind or solar. It imports a fifth of its electricity and produces pretty much all the rest from fossil fuels. (Sigh.) It can certainly do better. 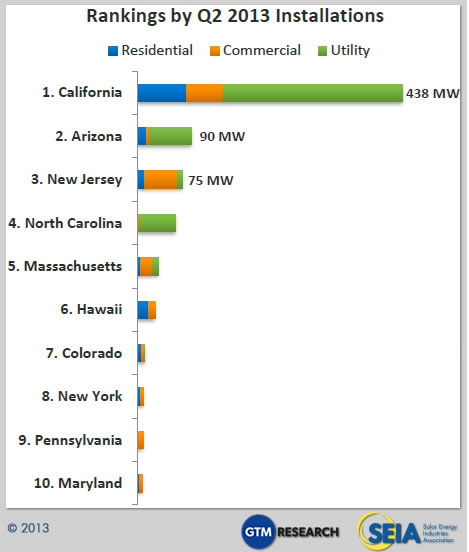 Middle Atlantic: Though New Jersey has next to no wind capacity installed, it has gone whole hog with residential solar! It has the third highest installed solar capacity of all US states, and 2nd quarter of 2013 it was also third for newly installed capacity. New Jersey imports 14% of its electricity, generates 45% through nuclear power, and has over half its electricity coming from fossil fuels. New York increased its wind capacity by 14% over last year but has done very little in the way of solar. Though it has good wind potential in the western part of the state, it produces about as much electricity from wind as Pennsylvania, a state with far less potential. New York imports a small percent of its electricity, gets 22% from hydro + renewables and 31% from nuclear. With its large population, New York is a high electricity-consuming state. Pennsylvania is a huge energy producer, generating more electricity than any other state except Texas. It exports 37% of its electricity, a fifth or so going to New Jersey and New York, and the rest likely going south. Pennsylvania ramped up its wind capacity by 50% this year over last. Still, wind makes up just 1.5% of the total electricity it produces. Pennsylvania is a huge nuclear state, second only to Illinois in the amount of nuclear energy it produces. And it burns a heck of a lot of fossil fuels (mostly coal.) If Pennsylvania didn’t export electricity, it could cut its fossil fuel consumption by two thirds. East North Central: Illinois is cantering ahead of this pack in terms of installed wind. It increased its wind generation by 25% over last year, and wind now makes up 5% of its total electric generation. This is substantial progress given much electricity this state generates. It also has a small amount of solar. Illinois exports 30% of the electricity it generates. If it didn’t export electricity it could cover 75% of its electricity demand with renewables + hydro + nuclear. Indiana has very good wind potential but it increased wind production by just 10% last year. Renewables make up less than 4% of its energy production. They have no nuclear, negligible hydro and solar, and are a small electricity exporter. Michigan doubled its wind capacity last year, but they are playing catch up even with Indiana. Michigan is self-sufficient in electricity generation with 27% coming from nuclear and 4% from renewables + hydro. Ohio imports 10% of its electricity, gets very little from wind or solar and 10% from nuclear. I’m depressed just thinking about it. Wisconsin has wind installed at a level comparable to Michigan—a little over 2% of their net electricity generation. They import a small amount of electricity. West North Central: This is the area of the country where things are really interesting! Iowa has been installing wind capacity like crazy, and it now generates a full 28% of its electricity from wind. But Iowa is also an electricity exporter. If we only consider the energy Iowa consumes, 35% is generated from wind! This is a great accomplishment. Kansas is also going pedal to the metal on wind. It doubled its installed wind capacity over last year, and is now producing 20% of its electricity via wind. It is also an electricity exporter, so if we just consider its electrical demand alone, 25% is covered by wind. Minnesota ramped up their wind capacity a bit and is now up to 16% of its electricity generated by wind. However, Minnesota imports a full quarter of its electricity, which, right now, means other states burn fossil fuels to make electricity to export to it. South Dakota and North Dakota come third and fifth in the region’s wind production derby, producing 28% and 15.5% of each state’s electricity via wind. Strangely enough, with all the great wind blowing through their states both North Dakota and South Dakota added no new wind generation capacity this year over last. If North Dakota had as much wind capacity installed as Iowa, and South Dakota as much as Oklahoma, both would have their electricity needs covered entirely. And then there are Nebraska and Missouri, pulling up the rear of the group. Now Missouri has decent, though not exceptional, wind and solar potential. (Better than New Jersey! Better than Germany!) However, it is moving forward on neither and burns large amounts of fossil fuels in order to be an energy exporter. Nebraska, on the other hand, has fabulous wind potential, just as good as Kansas and probably better than Iowa. (It also has pretty darn good solar potential.) And yet they’ve only installed one-fifth the wind capacity of Kansas, and one-tenth the wind capacity of Iowa. Why is all this beautiful, productive, cheap wind going to waste? Someone is asleep at the switch. South Atlantic: This is a region of the country that imports a lot of electricity. The only states that don’t are West Virginia, Florida and South Carolina. Except for little pockets of the Appalachia’s, these states don’t have great on shore wind potential, though offshore is a possibility for most. All, however, have good to very good solar potential. West Virginia has the best wind, and it’s installed a small amount of capacity but could have much more. It exports more energy than it consumes by burning coal. Sunny Florida is number 10 in the US in terms of total installed solar but seems to have flat-lined with little capacity being added. 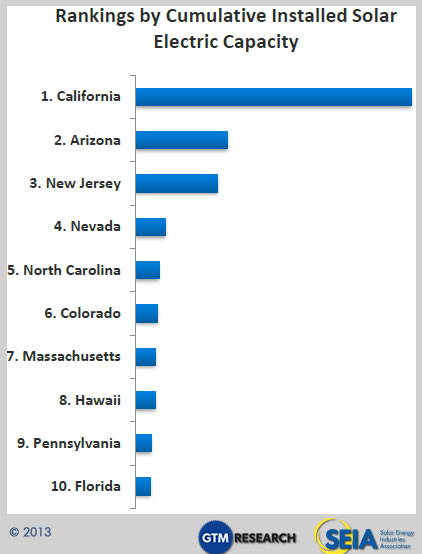 It wasn’t in the top ten states for solar installed in the 2nd quarter of 2013. Though Florida consumes more electricity than any state besides Texas and California, only 2% of its electricity comes from renewables. North Carolina is doing the best on solar in this sunny region, increasing its utility/IPP produced solar electricity by a factor of six in the last year! They were fourth in the nation in solar capacity installed in Q2 of 2013, and fifth in the nation for total cumulative capacity installed. Adjacent South Carolina, in contrast, has had almost no solar installation activity. Nor has Georgia, even though that state has solar potential Ohio would give its right arm for. Maryland has added a teeny bit of wind but you would think they would want to do more since they are a large electricity importer. The District of Columbia produces almost no electricity of any kind, relying nearly entirely on imports. 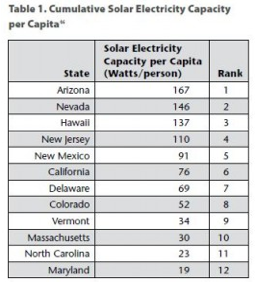 Interestingly, per capita, Delaware has the 7th highest solar PV capacity installed of any state (mostly residential), but they are such a small state with so little population, it hardly shows up on the radar. Delaware imports roughly a third of its electricity. Virginia also imports nearly a third of its electricity, and since they are a much bigger state, this adds up to a rather massive amount. Surprisingly, they’ve installed little wind or solar to speak of. 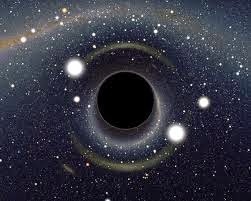 Basically a black hole for solar and wind. And yet all four have good to very good solar potential and all but Alabama have some wind potential where their states border the Mississippi river. All the states but Tennessee are electricity exporters; Tennessee is a very large importer. West South Central: Arkansas and Louisiana are two more black holes for solar and wind, both nuclear states, both net energy exporters, both burning lots of fossil fuels. Both have excellent solar potential and even a little wind potential. Texas and Oklahoma are a different story. 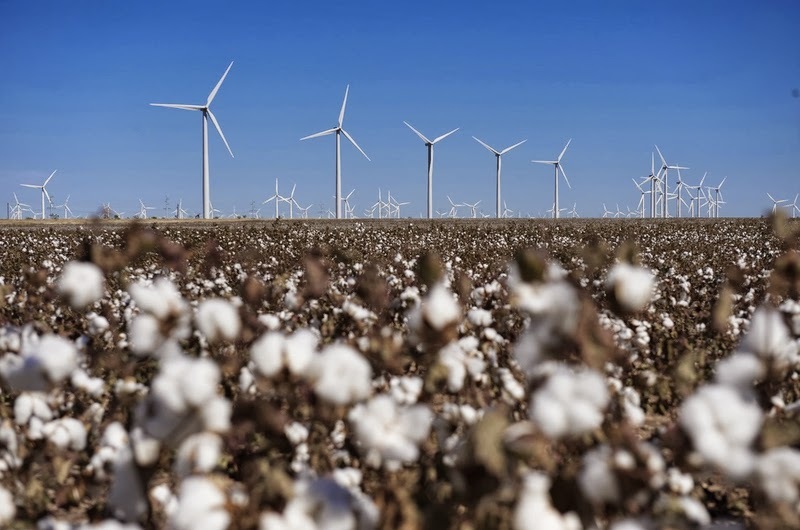 Texas has the most wind capacity installed of any state in the nation. However, because it produces more electricity than any state in the nation, wind comes to only 9% of all electricity produced. 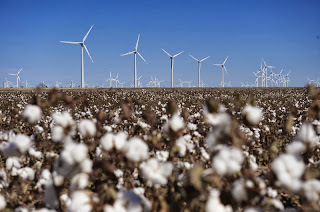 But this year alone Texas has increased wind capacity 18% over last year, and they increased their--admittedly limited amount--of solar capacity by 25%. Texas exports a huge amount of electricity, second only to Pennsylvania. They have excellent solar potential, especially in the western half of the state. 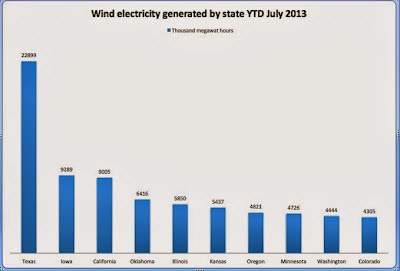 Oklahoma is playing catch up to Texas, increasing its wind capacity by 38% in one year! 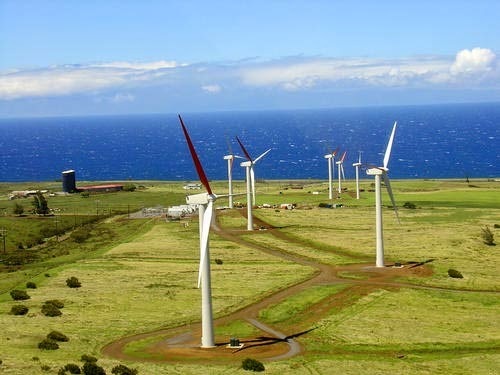 They are producing 13% of their electricity via wind, and 20% of the electricity they actually consume. (They are exporters as well.) Not much solar to speak of, although they, too, have excellent potential. 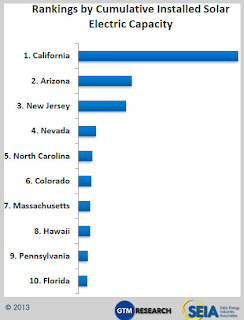 Mountain: These are states that have good to totally astonishing solar potential. Most have good to extremely good wind potential. 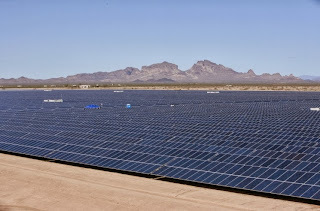 Arizona is doing the best with solar, as it should because it is one of the best places on the planet for it. Arizona more than doubled its installed solar capacity last year and is second for utility/IPP generated solar only behind California. It also nearly doubled its wind capacity last year. Even after all this, renewables still only make up 2% of its electricity generation. However, it is a big nuclear state and a big electricity exporter. Renewables + hydro + nuclear could cover 56% of its internal electricity consumption if the state stopped burning fossil fuels tomorrow. Nevada increased its utility/IPP solar generation of electricity by 68%, and its wind generation by ten fold! Renewables make up 11% of the electricity it consumes, and hydro + renewables makes up 19%. Nevada is fourth in the nation for total solar capacity installed (including residential) and second when considered per capita. New Mexico eked out small increases in both solar and wind, and is now up to nearly 8% of their electricity generated coming from the two together. They are an energy exporter. Colorado and Idaho both made great strides with wind capacity this year, increasing by 15% and 43% respectively. Wind +solar makes up 14% of Colorado’s consumption, and 13% of Idaho’s. Throw in hydro and you get 18% for Colorado and 59% for Idaho! Idaho imports almost a third of its electricity. Colorado generates close to as much electricity as it consumes. Montana and Wyoming are two more wind-rich states with good solar potential. 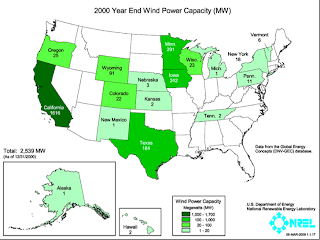 Montana increased wind capacity by 27% while Wyoming increased not at all. Neither state has much solar installed. Montana has a lot of hydro which allows hydro+renewables to supply 94% of its internal consumption. However, Montana still burns fossil fuels to make electricity to export to other states. Wyoming, being the preeminent coal state of the US, burns massive amounts of coal and exports that electricity to other states, including California. Wyoming also uses massive amounts of energy for their mining industry. If their mining industry ended tomorrow, their internal electricity needs would be covered by renewables + hydro, and they would have electricity left over to export. Utah could and should be a very good wind and a great solar state. It is neither. Pacific Contiguous: California continues its lead in solar and is working hard to pass Iowa to regain second place in the wind derby. 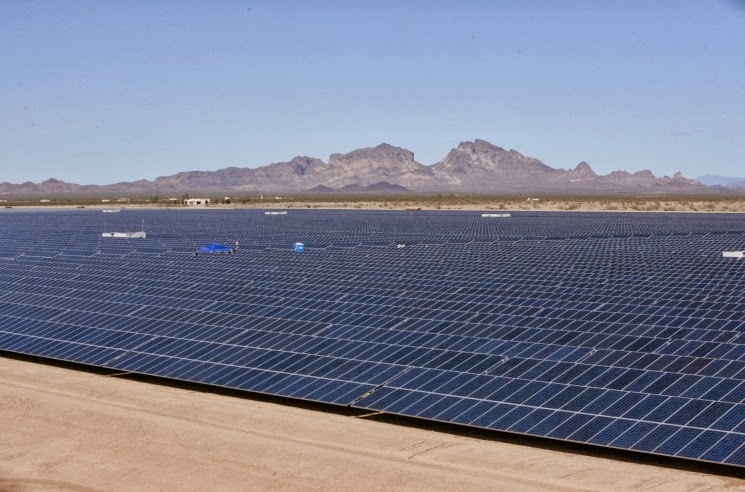 It more than doubled its utility/IPP solar capacity and increased its wind by 42% over last year. This is on top of already having the third wind largest installation in the US. It also produces quite a bit of electricity by way of geothermal and biomass, so its renewables produce 20% of the electricity it generates. California is very energy efficient and has one of the lowest per person consumption of electricity in the US. However, California is a big, big state with many people, and over the past decades it did not increase its electric generation in proportion to its growing population. This has turned California into the nation’s greatest importer of electricity, snarfing up pretty much all the excess electricity that might be lurking in any of the western-most states. 23% of California’s electricity currently comes from out of state. Some of this is hydro from the Pacific Northwest, but much of it is electricity from coal burnt by our more easterly neighbors. Still, the installation of sun and wind capacity go on, and just last week, in a 24 hr period on an average day in September, California produced 22% of the electricity it consumed via renewables. (solar thermal + solar PV + wind + small hydro+ geothermal + biogas+ biomass) I will guess by next summer California will be up to 25% via renewables. Oregon and Washington have very good wind potential and they are both ramping up wind capacity, though Oregon more so than Washington. Oregon increased wind generation over last year by 24%, pulling ahead of Washington who increased by only 3%. Renewables in Oregon make up 20% of electricity consumption, whereas in Washington they make up only 10%. But both states have lots of hydroelectric, and both export electricity (mostly to California.) If we just consider these states internal consumption, renewables + hydroelectric make up 99% of Oregon’s electricity and 103% of Washington’s. Pacific Noncontinguous: Alaska and Hawaii are their own special cases with difficulty importing or exporting electricity to/from other states. I’m pretty sure both within a decade will be reliant entirely on renewables for electricity, and the quicker they do it, the better off they will be. Alaska has very good to excellent wind potential but minimal wind capacity installed. Solar is tough for them, but it might get to the point that solar in summer alone is worth it. Alaska has a certain amount of hydroelectric and a small population, so hydro + renewables right now makes up 23% of their electricity consumption. If they were to build out their wind capacity merely to the extent Indiana or Wyoming has, they would be self-sufficient in electricity (though they would probably need some pumped hydro storage.) Hawaii has excellent solar potential and very good wind. It increased its wind capacity by 25% this last year but it’s still very small—only 5% of what they consume. They have no utility/IPP solar at all, though they have quite a bit of residential solar and are third in the nation for per capita solar capacity installed. If they built out their wind to the level of Oklahoma and their utility/IPP solar to that of Nevada, they would be in very good shape, though they would perhaps need to have some pumped hydro storage as well. So that concludes our tour solar and wind in the United States. Some states are leaping ahead; some are sitting on their hands. 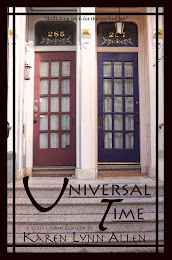 Who will be better off in ten year’s time? In the last year, the US has gone from 5.5% of its electricity generated from renewables to 6.4%, a much greater increase than ever before. I’m guessing we’ll be up to nearly 8% by next summer. Especially if Nebraska and South Dakota wake up and smell the kilowatts. Congrats! It really is impressive how far New Jersey has moved ahead in solar. I think you'll be very happy you made the investment in the coming years ahead. Nice Info! One of the reason against manufacturing solar modules is the fact that it does take power in order to manufacture them. You require to consider the fact, however, that the power used to manufacture solar module is going to eventually be outweighed by the power that is saved when using them.